Ghevar: Ghevar is a Rajasthani sweet traditionally associated with the Teej and Rakhi Festivals. Ghevar is disc-shaped and made from oil, flour and sugar syrup. Ghevar is traditionally prepared during the Saavan month of Hindus (July & August). Usually ghevar is served with warm milk. Ghevar is also very popular in weddings. Mix together the flour, corn flour and melted ghee in a bowl. Add one cup of water in a thin stream and whisk continuously. Whisk continuously till the ghee and water emulsify into a smooth mixture and do not separate. Add two more cups of water in a thin stream and whisk continuously to ensure again that the ghee and water do not separate. The batter should be of coating consistency. If necessary, add some more water to get the right consistency. Add in the sugar and 1/2 cup water. Stir the mixture till the sugar dissolves. Cook till the mixture comes to a boil. Cook till the syrup attains a one-string consistency. Add in 6-8 strands of saffron. Pour sufficient ghee in a non-stick kadai. Place a three-and-a half-inch round, 2-inch high mould in the centre, so that three-fourth of the height of the mould is immersed in the ghee. Heat the ghee on medium heat. Pour three ladlefuls of the batter into a small bowl. Add a pinch of soda bicarbonate and mix well. When the ghee is hot enough, pour one ladle of batter from the small bowl into the centre of the mould in a thin stream. When the centre is firm and cooked, gently pull out the ghevar from the mould with a wooden skewer inserted in the centre. Hold it over the kadai till most of the ghee drains away. Immerse the cooked ghevar in the sugar syrup for twenty minutes. Drain and place on a platter. 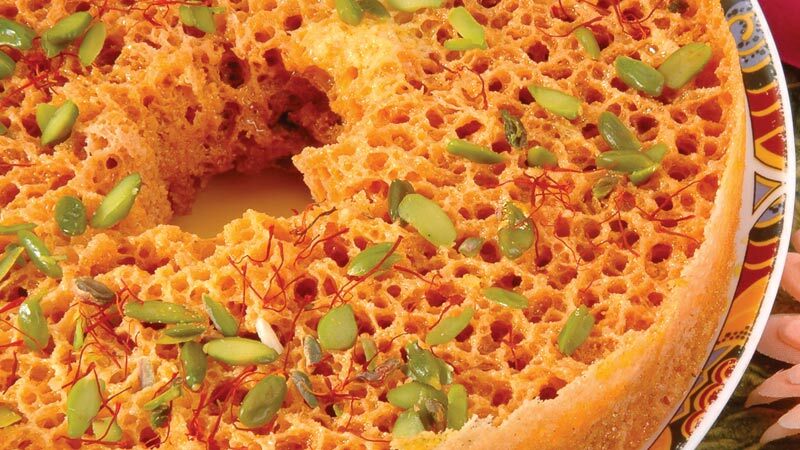 Garnish the ghevar with the saffron strands & almonds and pistachios slivers. Ghevar is ready to be served. Cool and serve the ghevar with warm milk. If you have any queries regarding the Ghevar recipe, please leave a comment.